Please ensure that you have created your packages first. 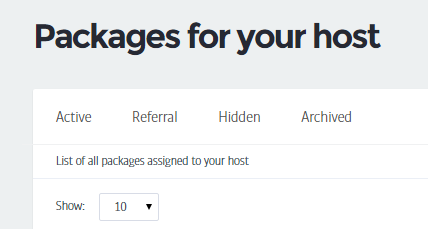 For a guide on how to set up packages, click here. First, please navigate to Sales > Packages. • Active packages are those which are visible to all members on your joining page. • Referral packages are those which will become visible only when a referral code is inserted on the joining page. • Hidden packages are ones are not visible to the public and require a special offer (promo) code. • Archived packages are old packages which are no longer in use, but may still have existing members linked to them. By clicking on the cog image next to any package, you can edit, duplicate or archive the package. Duplicating will create an exact copy of the package, and archiving the package will move it to the archived section where it will no longer be editable. Please note that by editing a package, this will only change the package for new joiners going forward. Anybody who joined the package prior to the change will still have a membership that follows the old rules. Therefore, we would recommend cloning and then archiving old packages, to keep visible who has signed onto which package version.